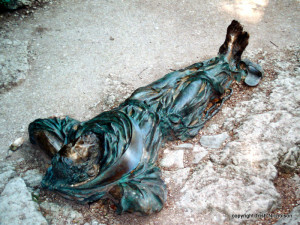 He is not Assisi’s only saint, but Saint Francis comes immediately to mind, revered not only by such disparate bodies as the Roman and Lutheran Churches and the Anglican community, but by New Age environmentalists – his fellowship universal and timeless. Francesco was the nickname given to baby Giovanni di Pietro di Bernadone by his father, a flourishing silk merchant, perhaps because his wife was French. 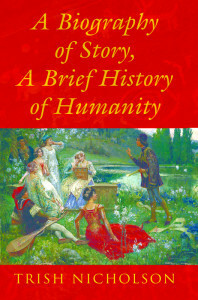 While Francis later chose poverty as the basis of his life, he retained the gaiety of youth: joyfulness and friendliness to all beings was the first tenet of his philosophy. 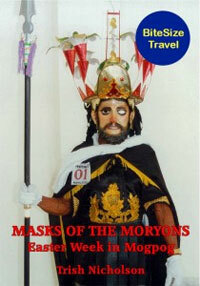 He and his young followers sang their way through the streets and surrounding countryside preaching their message. 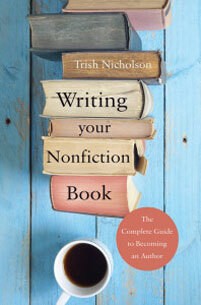 Wandering through the older, quieter parts of town you could almost hear their echo. Even as a youngster he was sensitive to the poor. 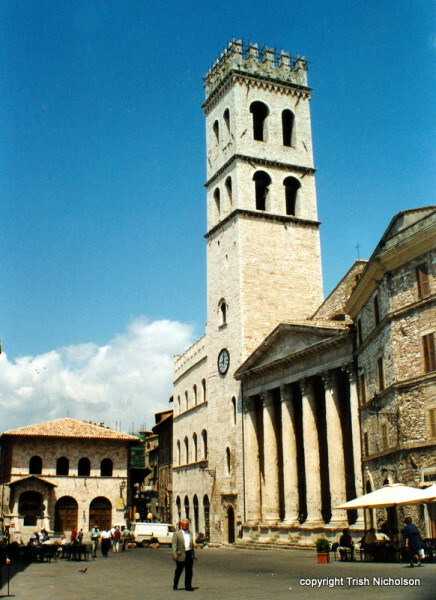 Perhaps it was in the Piazza del Commune – Assisi’s central square, the old Roman forum pictured below – that Francis sold his father’s fabrics in the market and, on one occasion, gave the day’s takings to a beggar; receiving a beating for his recklessness. And maybe it was here, too, that years later he publicly and formally renounced his inheritance, returning to his father even the clothes he wore. 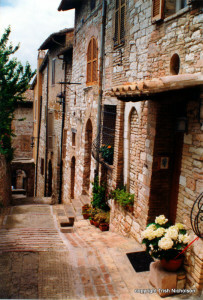 Assisi has a long history. Even 3,000 years ago, the hills in this undulating part of central Italy provided defensive sites for small fortified towns. First the Umbrians then the Etruscans held sway, until 295 BC when the Romans prevailed and built the walled city of Asisium ascending the flanks of Mount Subasio. In the turbulent years of Rome’s decline, rampaging war lords competed for dominance. One such feudal tyrant from the north built the massive castle of Rocca Maggiore on the summit of Subasio in 1174. 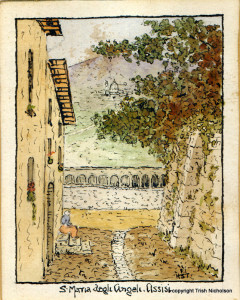 By the time of Francis’ nineteenth birthday, in 1201, Assisi was expanding beyond the city walls and fighting for its independence from neighbouring Perugia. Francis enlisted as a soldier in this ongoing battle, but was later captured and spent a year as a prisoner of war. 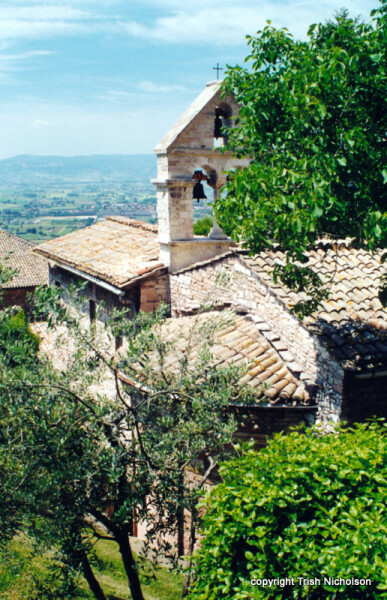 After recovering from severe illness, he signed up as a soldier again in 1205, but he had a vision to return to Assisi where he began his cheerful barefoot life of penance and preaching. 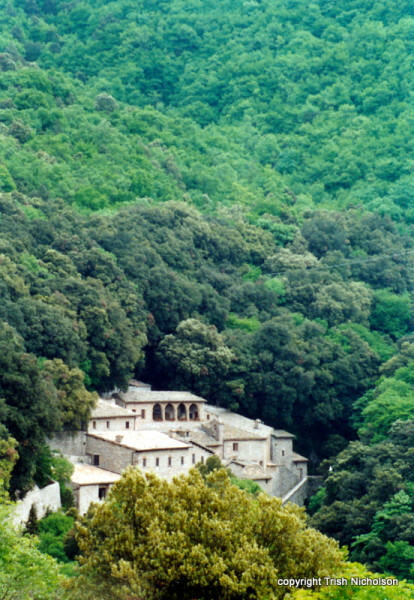 His favourite place for meditation was Eremo delle Carceri, an ancient Benedictine hermitage in a gorge between Mount Subasio and Mount San Rufino. 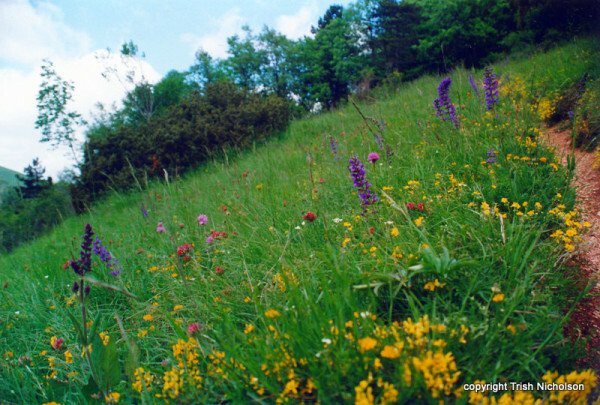 He probably walked the same 4 km route that I followed – in sensible sandals – from the eastern gate (Porto Cappuccini), looking back on the hazy heat of Assisi, and delighting in flower speckled meadows on the way. 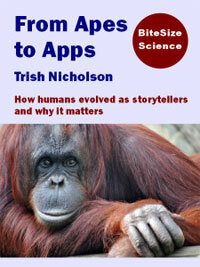 In Francis’ time, he and his brethren stayed in caves in the hillside. 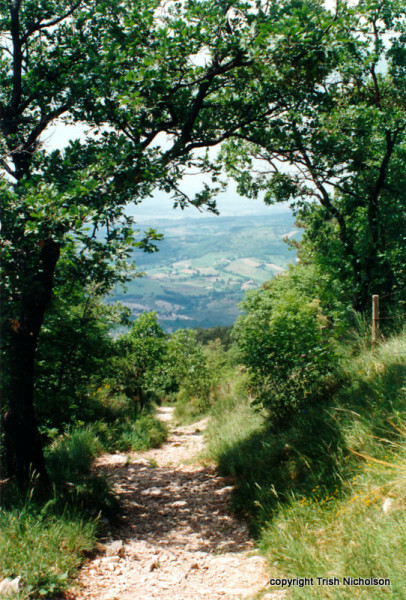 A trail leads through the places they would have strolled, talked and prayed, marked by simple rock shrines and a bronze figure of Francis meditating. Since then, a monastery, church and other buildings were added, but friars still live here and welcome visitors. 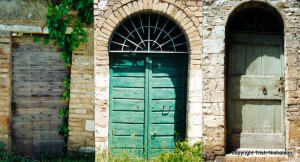 Another of his favourite places to pray – the secluded spot where he received his first inspiration – was the old, almost ruined, church of San Damiano a kilometre outside the city walls to the south, through Porta Nuova. 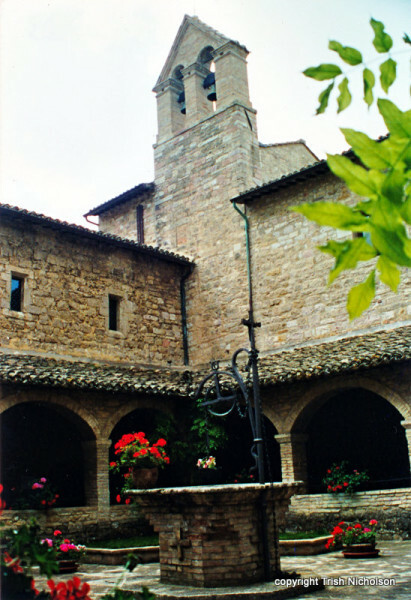 San Damiano has been renovated and extended many times since the young Francis sold his horse to help repair the original building. It was here that one of his earliest and most ardent followers, Chiara Offreduccio, daughter of a noble family, eventually set up a convent, the Order of San Damiano. She took the religious name of Clare, the Order since becoming known as the Poor Clares. Her sister Agnes and, much later, her mother, joined her. She died on 11 August 1253 at the age of 59 years and was canonised as Saint Clare of Assisi. 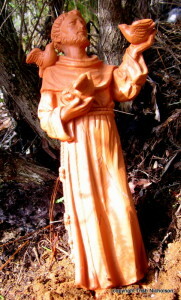 Poor Clares are established all over the world. A ‘closed order’, nuns never leave the convent; their role to be self sufficient through their own labour, and to have at least one of their number in the chapel, praying for humanity 24 hours a day. 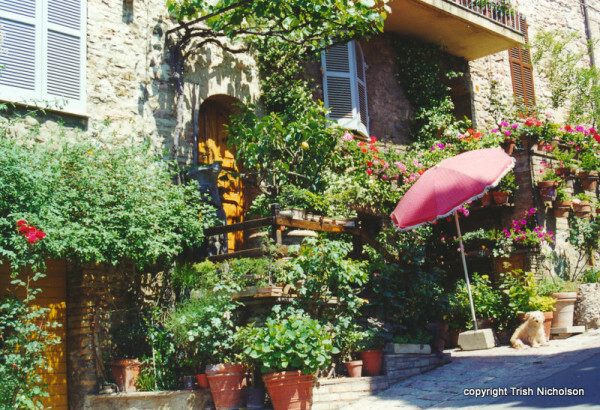 I stayed at a convent in Assisi myself, run by a different religious order which supports itself by offering accommodation to visitors – of whatever religion or none – but I was free to roam. 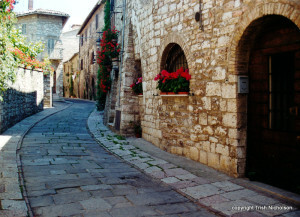 To gaze at fascinating doorways, courtyards and old churches… Assisi is a popular destination for daytrips, but staying a week I enjoyed each day the cool tranquillity of sunrise with its aroma of freshly baked bread. 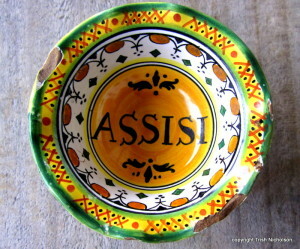 I was inspired to come by my grandfather’s pilgrimage here around the early 1900s – among his souvenirs, the little majolica ware bowl pictured at the top of the page. His watercolour sketch, now foxed with age, drew my attention to the church of San Maria del Angeli – an enigmatic inked outline in the distance of his painting. I understood why this might be when I saw it one morning in the delicate light of a misty dawn. 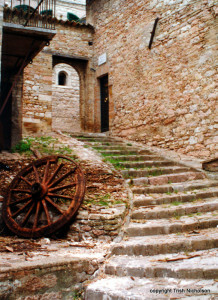 About 5 km from Assisi, a suburb has grown around it, but it is here that the Franciscan story had its formal beginning. 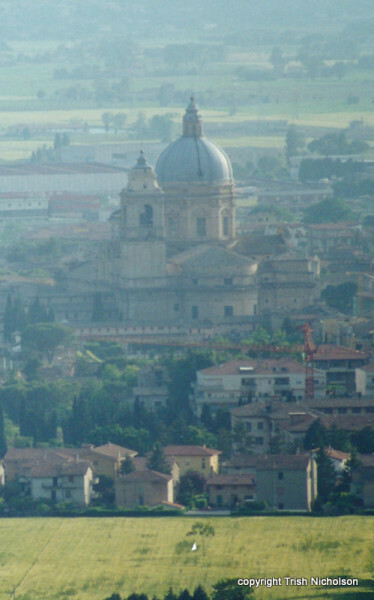 Within this protective, 16th century domed Basilica is the tiny (18 sq.m. ), ancient church of Porziuncola, complete with bell tower, given to Francis by the Benedictines as the mother church of his new Franciscan Order. 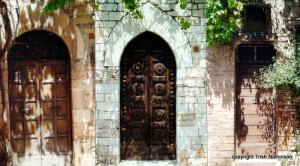 The building was dilapidated; Francis repaired much of the stonework himself. 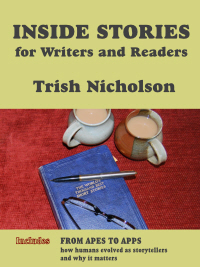 He and his disciples lived in cells beside the church when not travelling and preaching. On October 3 1226, suffering from his final illness and nursed by Clare, Francis died while singing psalms in the Porziuncola. He was 44 years old. Within two years he was canonised a saint and Pope Gregory lX had set the foundation stone for the Basilica of Saint Francis in Assisi, where his remains are preserved in the crypt. Exquisite medieval frescoes of his life by Giotto, Cimabue, and Cavallini, among others, were carefully restored after the major earthquake in Umbria in 1997. 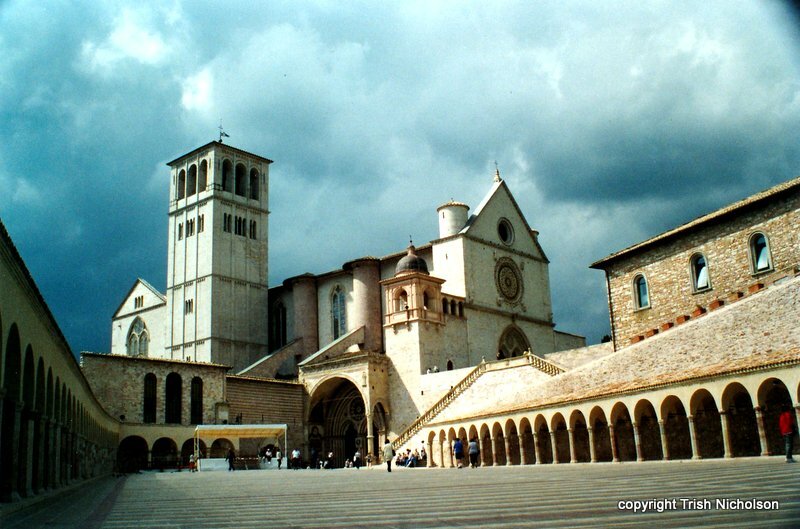 Since 2000, sacred buildings in Assisi have been designated a World Heritage Site. The city’s other saints are Agnes, Rufinus, Vitalis, Sylvester, and Gabriel of Our Lady of Sorrows. 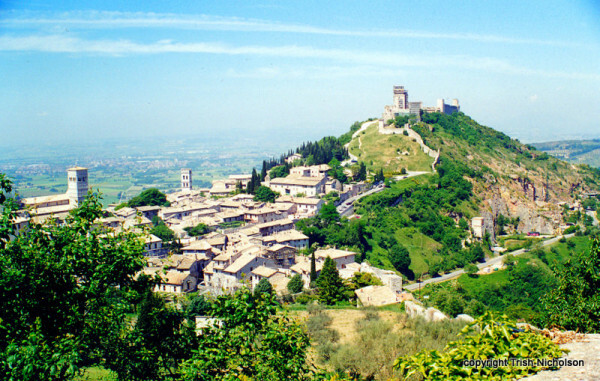 Colour and gaiety enhance Assisi’s ambience of peaceful sanctity – they are not incompatible. 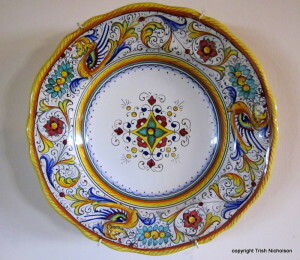 And, more than a hundred years later, I brought back a piece of majolica ware, too. 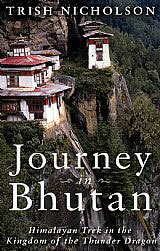 If you like to read travelogue, you will enjoy the ebook Journey in Bhutan: Himalayan Trek in the Kingdom of the Thunder Dragon. 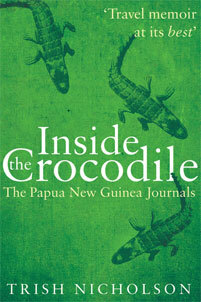 And adventures Inside the Crocodile: The Papua New Guinea Journals. How great that you could stay for a whole week – there’s so many places that tourists just look at that gather a whole new meaning when you can stay there. These are lovely pics – thank you. 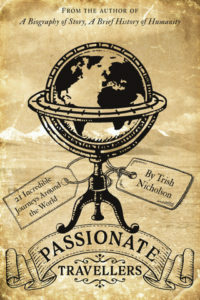 I really enjoyed this post Trish.What lovely wee winding streets,so full of charcter and history. The story of St Francis is amazing.There’s so many good stories about why people becames saints and of their earlier life. I like the pottery and the though of living in an old convent is so appealing and I have no idea why,maybe it’s because it’s just different. Sorry this comment is so late but I replied on ipad and it went into cyberspace and this is me just getting around to doing it on pc. Thank you for coming back to comment, Anne. Convents can be surprising places, I’ve stayed in many, in Australia and especially in Papua New Guinea – sometimes the only accommodation when working in the bush – and the sound I associate with them is the laughter of nuns! The Fransiscans are particularly good fun.